The plight of the working poor has often been a subject in art, from the folk songs of Woody Guthrie to John Steinbeck’s The Grapes of Wrath and Bruce Springteen’s Youngstown. The struggles of the working poor and the fallacy of the American Dream dates back to long before Donald Trump took the White House, and includes all races. 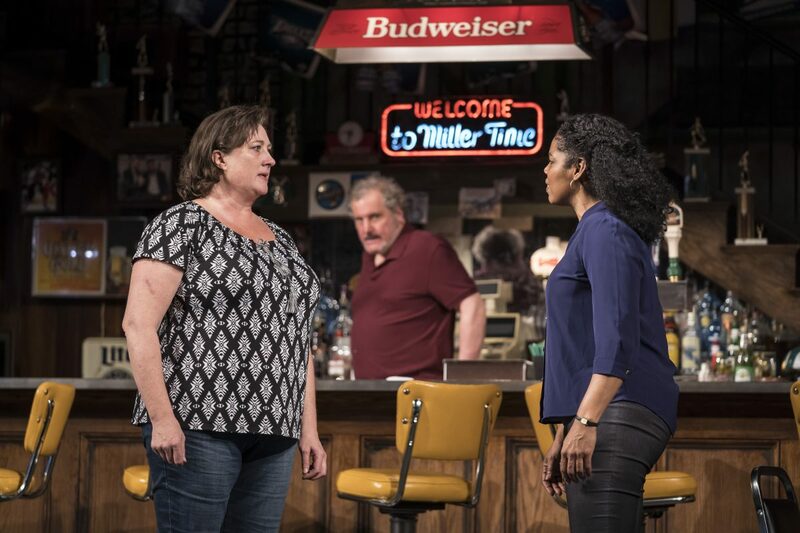 Rarely is it captured in art as accurately and poignantly as in playwright Lynn Nottage’s potent and powerful “Sweat,” which won the Pulitzer Prize for drama in 2017 and is currently at the Goodman Theatre. Directed by Ron OJ Parson, it’s the first time it’s been staged in Chicago and was just extended through April 21. It is the story of a group of union workers in a Pennsylvania steel town — set mostly in a tavern managed by a former worker (Stan, played by Keith Kupferer) who now bartends after getting hurt at the plant where his patrons come from. The play takes place in 2010, but mostly flashes between 2000 and 2008, when the workers face a dilemma — whether to agree to have their wages cut by 50 percent or to strike and risk never getting their jobs back; and the aftermath of a climatic scene that I’ll not describe here in order to avoid any spoilers. We see how the stress of the workplace in a one-industry town pits workers who are friends and drinking buddies against each other — which is exactly the type of diversion the company higher-ups want. Instead of blaming the company for inhuman conditions, or their union for not fighting hard enough for them, we see white friends Tracey (Kirsten Fitzgerald in an excellent role) and Jessie (Chaon Cross) assume their African-American friend and co-worker Cynthia (Tyla Abercrumbie) gets promoted to management because of her race. But this is not a piece where the whites are the only villians. There is some in-your-face racism but the genius of the play is the more subtle blaming — and it is not just white against black or black against white. For example, we see how the workers, black and white together perpetuate stereotypes agains Latinxs in a powerful scene where Tracey, a white worker, says she can’t blame Columbian Oscar, a barback who takes a job as a replacement worker at the plant, because “he has 17 relatives in his apartment to feed.” We also see shades of grey, with African-American Evan telling his friends not to be mad at Oscar, for he is “hustling” to make ends meet just as they would in the same situation. All the characters are villians and victims in “Sweat.” It’s this nuance that makes “Sweat” truly great and what separates it from most dramatic productions that focus on the working class. And just as it isn’t a story of black versus white, it isn’t a story of only working “men.” It’s the more accurate story of the working class, which includes all genders and races, struggling together against a changing time due to a global economy, advanced technology and lack of empathy or gratitude from faceless corporations. Watching it at the Goodman, I wondered how many in the affluent audience had actually been to a working class town or even to a working class tavern, many of which can still be found in several Chicago neighborhoods between Jefferson Park and Hegewisch (but not in River North or Lincoln Park). Based on their stunned reaction when Stan the bartender hits the bar with a baseball bat, which I saw coming (and that isn’t a negative shot at the play) — I’d say not many. Evan’s realization, which he points out to his friends about Oscar resonates today because while Trump did not create the hardship for the working class, he has added to the blame game. To be clear, the characters in “Sweat” are not Trump voters, they aren’t even voters at all — at least not Stan, the most informed of the crew who says he’s refusing to vote because no matter who wins, they all lose. The other characters don’t even pay attention to the news, probably because they have enough concerns to deal with. In the play, Cynthia alludes to this theme when referring to her son, who works on the line in the plant, saying she is grateful things are falling apart because he’s young enough to get more education and leave the failing town, unlike her and her friends who are lifers by this point. That made me think of yet another Springsteen lyric, from 1995’s Straight Time (You can get used to anything, sooner or later it becomes your life). The play is about 2 hours 30 minutes with a 20-minute intermission. 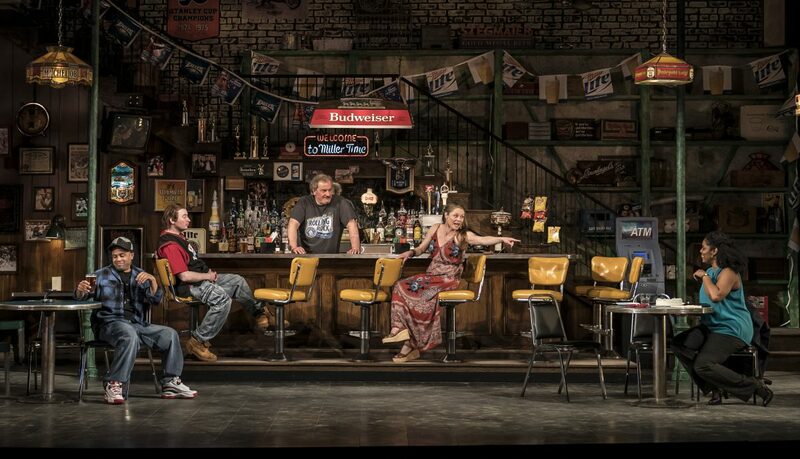 Sweat is at the Goodman Theatre, 170 N. Dearborn Street through April 21.